Father Cornelius O’Mongan was a priest during the era of Catholic Penal Laws in Ireland. He was the “registered” parish priest of Aghyaran (Termonamongan) and Urney in County Tyrone and Killygordon (Donaghmore) in County Donegal. As a result of Irish rebellions in the 17th century, laws were established by England to keep Catholics in ignorance and out of civil life. The hope was that Catholicism would be extinct after a few generations. Earlier many priests and bishops were expelled during the Puritan rule in England. Priests were rare and Catholicism went underground. Congregations only saw a priest in rare instances. When a priest was available, Mass was celebrated at Mass rocks in hidden places. When a priest was not available, religious services were reduced to saying the rosary at the site of these same Mass rocks. In the 1690s under William and Mary, the Catholic Penal Laws were passed. In addition to many laws restricting Catholics from being educated and owning property, they also prevented priests from being ordained. They also kept priests who were educated abroad from returning to Ireland. Cornelius O’Mongan studied for the priesthood and was ordained by Archbishop Oliver Plunkett of Armagh around 1674. Nothing of his life during the peak years of Catholic persecution is known until 1703, when the Registration Act allowed one, and only one, Catholic priest per parish. In 1704, Father O’Mongan registered for the three parishes in Ulster mentioned above. At that time, 1089 priests registered in Ireland. No further registrations were permitted, so as the priests died they would not be replaced, and Catholicism in Ireland would die of attrition. In 1709 there was a fear that there would be an attempt to replace Queen Anne with her Catholic brother, James III. The Oath of Abjuration was required of all government officials to assure that there would be allegiance only to the Queen and not to the Stuarts. The registered priests were required to take the oath as well. This was unpopular with Catholics, and only 33 of the 1089 registered priests took the oath. Those who refused the oath lost the right to minister to their parishes, and they became renegades and hunted men. Masses were celebrated in secret again, in private dwellings and outdoors at the Mass rocks. Soldiers and mercenary “priest hunters” sought them out. Volunteer scouts secretly brought the priests into the parishes for celebrating Mass, and they kept an eye out for strangers during the service. At the conclusion of Mass, they helped the priests safely out of the parish. Father O’Mongan was one of those renegade priests who tended his flock in secret at the Mass rocks in his parishes. There is a story that he was observed by redcoats at Mass one day in County Tyrone and had to escape by crossing the River Derg (or Mourne Beg River) to a mill on the other side. 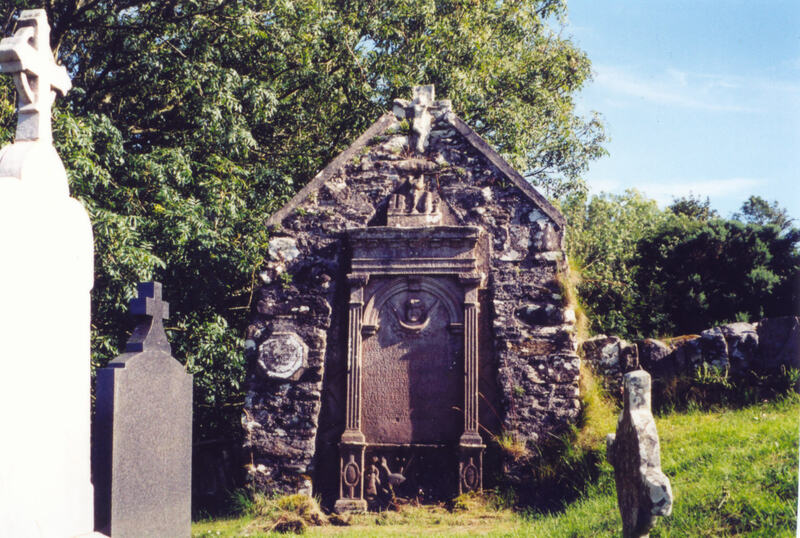 The miller, a Protestant named Kyle, hid Father O’Mongan until the soldiers left the area. The story indicates the cooperation between Catholics and Protestants at that time in Ulster. Father O’Mongan died around 1725 in the middle of this Catholic persecution period. 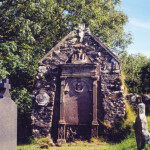 He is interred in a tomb at the graveyard in Magerakeel, Aghyaran Parish, County Tyrone.